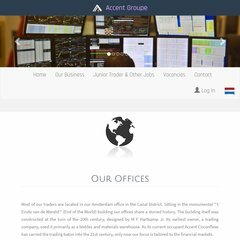 Topics: Accent Circonflexe Groupe, Organisations, Career, Traders, It Professionals, and Vacancies. ns2.dutch-server.com, and ns1.dutch-server.com are its DNS Nameservers. The programming language environment is PHP/5.2.17. It is hosted by Leaseweb Amsterdam, using Apache/2 web server. PING www. (85.17.205.138) 56(84) bytes of data.